Do you have a favorite miracle in the scriptures that reminds you of God’s love or the Savior’s power? For most of my life, my favorite miracle has been that of giving sight to the blind. I love the miracle of receiving sight because I had bad vision from the 5th grade until recently. While not as difficult a challenge as those who are legally blind experience, having poor vision is an impairment to life. Without correction, some things are impossible to see or do and most things are always fuzzy. When I first got contacts, it was a small miracle. I didn’t know that others saw things differently than I did. I only knew my own world and it was amazing to see something different. This year, I had LASIK surgery to correct my vision, which in itself is a modern-day miracle. After my eyes had healed, it felt much like those first moments after getting contacts—I felt renewed and empowered. My eyes had been healed and my vision corrected. I still sometimes get emotional about the miracle it is to just wake up and see. I don’t have to do anything but open my eyes. Through the scriptures and the ways Christ chooses to heal, it is clear to me that blessing people with vision is important. But of more importance than physical vision, I believe, is having a clear spiritual vision of our lives. The scriptures teach of those who have their “understanding darkened…because of the blindness of their heart” (Ephesians 4:18). We also learn about blindness in our minds (Alma 14:6). And even that spiritual blindness comes from “looking beyond the mark” (Jacob 4:14). As we learn in one of the best motivational-speech scriptures in Proverbs, “Where there is no vision, the people perish” (Proverbs 29:18). These scriptures emphasize the importance of having clear spiritual vision. In the April 2012 general conference, Elder O. Vincent Haleck of the 70 spoke on “Having the Vision to Do.” He shared the following, “We experience hard things in our lives that can sometimes diminish our vision and faith to do the things we should. We become so busy that we often feel overwhelmed and unable to do any more. While each of us is different, I humbly submit that we must focus our vision on the Savior and His teachings” (emphasis added). So what is our vision currently like, and how can we focus our vision on the Savior and thus improve our spiritual vision? I would like to suggest 3 ways to improve our spiritual vision: SEE ourselves and others as God sees us, LOOK FOR God’s hand in our lives, and OPEN OUR EYES to our personal mission. First, see ourselves and others as God sees us. Elder Haleck also said, “How do we, admidst the challenges of our lives, gain the vision necessary to do those things that will bring us closer to the Savior?…If we are to prosper rather than perish, we must gain a vision of ourselves as the Savior sees us.” And I would add gain a vision of others as the Savior sees them as well. I am grateful for a loving Father and a Savior who see so much more in me than I see in myself and allow me opportunities to feel their love. Coming to see myself as God sees me is hard—there are days I see it and days I don’t. But what matters is to keep trying. And when dealing with seeing others the way God sees them? Perhaps even harder. I believe this requires a great deal of charity, and being more charitable is often a challenge for me. In recent times, as I’ve done a self-evaluation and asked my Heavenly Father in prayer, “What lack I yet?” the word charity echoes in my mind, as I need to not only SEE others through God’s eyes, but love them as Christ would. A few weeks ago, I was walking downtown and a homeless man was coming up the street. He was clearly having some mental health issues, possibly influenced by alcohol or drugs. He was yelling and swearing at empty space and hitting things as he walked by them. I was actually a little nervous that he may do something to hurt people, and I was tense as he passed by. But I had a distinct thought come into my head, “God loves him.” While instinctively I know this is true, I had to pause for a moment and pay attention to what I was feeling. “God loves that man. He loves him. All the time. Anywhere. Always.” And there wasn’t a “but” here, meaning “but he’s sad about what he’s doing.” Of course our Father is sad when any of His children make poor choices, and among ourselves we make plenty of poor choices as well. But I felt a sense of compassion toward that man. This micro-moment was a reminder to me of how I can increase my vision of who others really are and what God sees they can become. I have been touched and impressed at the openness of my new ward ward in sharing struggles, doubts, and fears. As I have met the members of my ward and learned stories of heartache, divorce, illness, and loneliness, among many other challenges, I have been blessed with spiritual eyes of understanding. To those of you who are struggling to see yourself as God sees you, I understand it can be hard. Just know that you are in the right place right now where others will help you see what God sees in you. The second way we can improve our spiritual vision is to LOOK FOR God’s hand in our lives. Our Father in Heaven and our Savior know that it’s hard to keep our vision clear, so they gave us the gift of the Holy Ghost, an incomprehensible and beautiful gift—the companionship of a comforter, a testifier, a being who is a member of the Godhead. Have you ever felt like you are seeking out the guidance of the Spirit and that you feel blocked? Or stalled? Or that no answer is coming? I feel like that a lot on big decisions or on things that completely perplex me and leave my Spirit wanting. However, I have found that when I’m lacking vision, I need to ask in prayer, “Help me to see thy hand in my life.” Sometimes this is also followed up by “Who can I help today?” or “Who can I reach out to?” The Spirit seems to provide guidance on those questions eagerly and readily. This reminds me the Spirit is there, guiding me along. God is not absent. He is sending reassurances all the time if we open our eyes to see that His divine hand is indeed in our lives. A small moment I’d like to share occurred my first Sunday in my new family ward a few weeks ago–a different experience after 12 years of being in YSA Wards (excluding my mission). I was, in short, scared and I felt pretty alone. As I sat in the pew, I kept repeating in my mind, “Don’t cry; don’t cry; don’t cry.” But then I felt prompted, “Just turn around and talk to someone.” So I did. And I met a new friend, Amanda, in the row behind me and we struck up a conversation. Having responded to the prompting, I didn’t feel as alone. And probably through promptings she received, she immediately connected me with a few sisters as the meeting ended and brought them to meet me. The bigger questions in my head were, “Will I fit in? Am I wanted and needed here?” The Spirit could have provided some answers, but instead prompted, “Just turn around and talk to someone.” And that micro-moment helped me not to sit in darkness but instead look for God’s hand in my life—in the people who were surrounding me. If you are not seeing God’s hand in your life, ask to see it, look for His hand in all things, and you will begin to see. We are also encouraged to record those moments so that we can remember them when we lack the vision or faith to see. Some years ago, in the October 2007 general conference, President Henry B. Eyring shared an experience he had where he felt God’s hand in His life and was immediately prompted to write it down. This became a pattern for President Eyring. He shared, “I wrote down a few lines every day for years. I never missed a day no matter how tired I was or how early I would have to start the next day. Before I would write, I would ponder this question: “Have I seen the hand of God reaching out to touch us or our children or our family today?” As I kept at it, something began to happen. As I would cast my mind over the day, I would see evidence of what God had done for one of us that I had not recognized in the busy moments of the day. As that happened, and it happened often, I realized that trying to remember had allowed God to show me what He had done. I know this to be true and have been blessed by others following this counsel. As I recently moved, it gave me the opportunity to go through all of my possessions. I am a family history nut so I had about 8 boxes full of family history papers, documents, and pictures (I think family history is the only thing that contends with food storage for being the worst thing to move). As I was looking for something, I came across an experience from my grandmother. In the early 1980s, before I was born, she wrote an experience of a moment of struggling. Several years before, my uncle had been killed in the Vietnam War and my grandpa had passed away unexpectedly a few years later after a heart surgery. She had been living alone for several years and the tone of her musings was disheartened. In a dream one night, she saw her mother and wanted to be called Home. But she had the distinct impression, basically saying, “You cannot come—you need to write your life history.” My grandma lived for 30 more years and spent a lot of that time sharing her testimony with us and with others, and working on her life history. Because she wrote and shared her life experiences, my testimony has been strengthened that God’s hand is in our lives. The third thing to improve our vision is to OPEN OUR EYES to understand our personal mission. I love the example of Esther in the Old Testament. 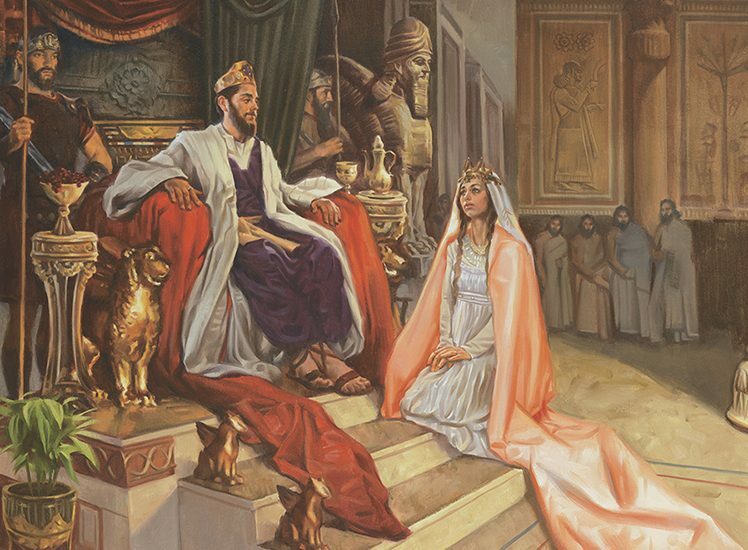 Esther was a young Jewish girl who became wife to the king of the land. She did not disclose her Jewish heritage or beliefs at first, by direction of her uncle Mordecai. However, through the wicked influence of one of the king’s advisors, Haman, a declaration went forth that all the Jews should be killed. And “there was a great mourning among the Jews, and fasting, and weeping, and wailing…then was the queen exceedingly grieved.” Mordecai counseled Esther to go before the king in behalf of her people (see Esther). Esther did go unto the king. She petitioned on behalf of her people. She explained the situation. And the king reversed the order to kill the Jews. She saved her people because she came to see her personal vision and mission in life. She had been saved “for such a time as this”. How can you come to see your personal vision and mission? Our patriarchal blessings can provide us great guidance. Fasting, prayer, reading the scriptures, attending Church, and spending time in the temple can also help us clear our minds to know what God wants us to do. And sometimes just acting in faith can help us be what God wants us to be. It can be difficult to maintain a vision of our personal mission. When I returned home from my full-time mission 9 years ago, I struggled to find my next steps in my own personal mission. It was a tough transition for me as I tried to understand what could be more useful in my life than serving God full-time as a missionary. I worked, and prayed, and had patience, and gradually felt comfortable in “normal” life again—realizing that my own personal mission was simply to do what I had already been doing and what God was continuing to ask me to do in different ways—to serve His children. Yet I must admit that my vision of my personal mission became clouded again recently. Before moving to my new ward ward, I had lived in the Millcreek area and had been in the same young single adult ward for 7 years. I love that ward and grew so much there. I had a support group of so many people I knew and loved. I was serving in a stake calling and felt that I had so much more that I wanted and needed to do. But I was facing a transition. YSA wards don’t necessarily kick you out when you’re 31, but the leaders do invite you to consider where you should be. And as I approached 32, I felt that I needed to make a change. This was hard for me to have to do simply because of my age and my marital status. It was months of prayer and pondering to try to feel God’s direction for me. In one of my prayers, I distinctly felt the impression that I was needed somewhere else. With a prayer in my heart of “I’ll go where you want me to go”, this helped me move forward with some other big decisions, one of which was buying a home. In a whirl of events, I found my home and moved. In one fell swoop, I left my ward of 7 years and the familiar young single adult experience and a calling I loved and an area I was familiar with. Something else happened that day that confirmed God was still aware of me and that he had a mission for me to perform. That was the day of a missionary farewell and Alex and his friends sang one of the most beautiful arrangements of the prayer in my heart, “I’ll go where you want me to go.” If you’re wondering, I DID cry all the way through that song so my mantra “don’t cry” failed me. I would like to share the words here. If you are wondering what your own personal mission is, perhaps you can also find direction and comfort in this hymn. We have all been born “for such a time as this” and we need to open our eyes to the glorious mission that our Father has for us. To go where He wants us to go, say what He wants us to say, do what He wants us to do, and be what He wants us to be. One caution as we seek to improve our spiritual vision—do not get discouraged. Our vision may be damaged. We may feel we are spiritually blind. We may have even closed our eyes to the vision that God has for us. But if we have been living in darkness, we just need to turn to the light. Just as Christ performed the miracle of helping those physically blind to see, He can help us heal our spiritual eyes so that seeing, we too may believe. God can help us and lovingly guide us to change our vision and correct our eyes of misunderstanding, anger, hurt, despair, or pain. God can help us change how we see ourselves and how we see others. He can help us see His hand in our lives. And He can help us find our personal mission. Thank you for sharing! This lady year has been a rough one with lots of changes! I have had days and weeks where I felt closed from the Lord. I started a “tender mercies” journal. On those days I feel “blocked” I open the journal to see those blessings and then look for those new “mercies” to keep me moving forward with faith. I needed your talk tonight to move me forward again.